Want to earn 10% of sales directly to you? Thank you for your interest in joining us! We know that you already like to share our posts with your friends so why not get something out of it for you?? Simply fill out your details below to get started and you will receive a log-in link to your email address where you can log in and set up your own personal link that you are free to post anywhere you wish, and anyone who visits our website and places an order using that link, you will receive 10% of their order value, paid to you in cash directly to your nominated Paypal email each week. There is no cost to you to set it up, no catches and you are free to do as much or as little as you wish. There is no minimum you have to reach or a maximum to get the 10%, you receive it for EVERY order that comes through your link. Share it on your Facebook, Twitter, Instagram pages, if you see someone searching for something we offer in groups, on your own website or anywhere you want to! Use your link and get the credit for it, 10% of all orders (excluding shipping costs) is paid to you all for posting a link! Simple, right? 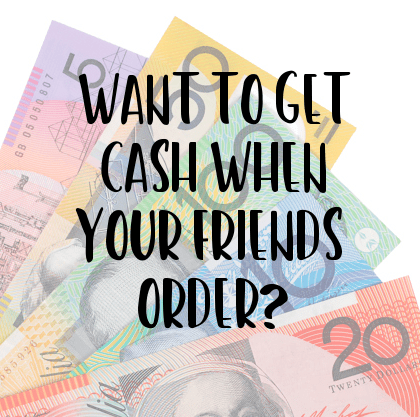 You will receive an email from us with your account details where you will be able to view any referrals received through your link, how much you have earned and all payments made to you. You have the option in there to create your link so only you have access to it and can find it anytime you need to. I cant wait to hear from you.